The official online guide to hundreds of occupations. Use this link if you want to browse occupations or use advanced searching to limit to a range of different career choices. United States. Dept. of Labor. Bureau of Labor Statistics. "Document or Article Name." 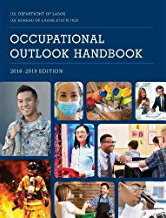 2018-19 Occupational Outlook Handbook, 13 Sept. 2018, bls.gov/ooh/healthcare/athletic-trainers.htm.